OnStage 2016! Some pretties from SLC! I just got home from OnStage 2016 in Salt Lake City! It was soooo much fun! Lot’s of fantastic inspiration and all my creative cells are on fire and ready to make some pretty things 🙂 It was a great week with friends too, laughing and just enjoying time together. I didn’t make any swaps this year, I just brought a few cards for downline sisters and friends. I didn’t have a lot of time before my trip to put anything together so I made this simple project the night before I left for Salt Lake. It is so simple yet sweet and elegant. The gold embossed image makes it classy yet easy to put together. My second project is a cute gift bag I made for my BFF and roomie in SLC. I had a little gift for her and I needed something quick and easy to put it in. 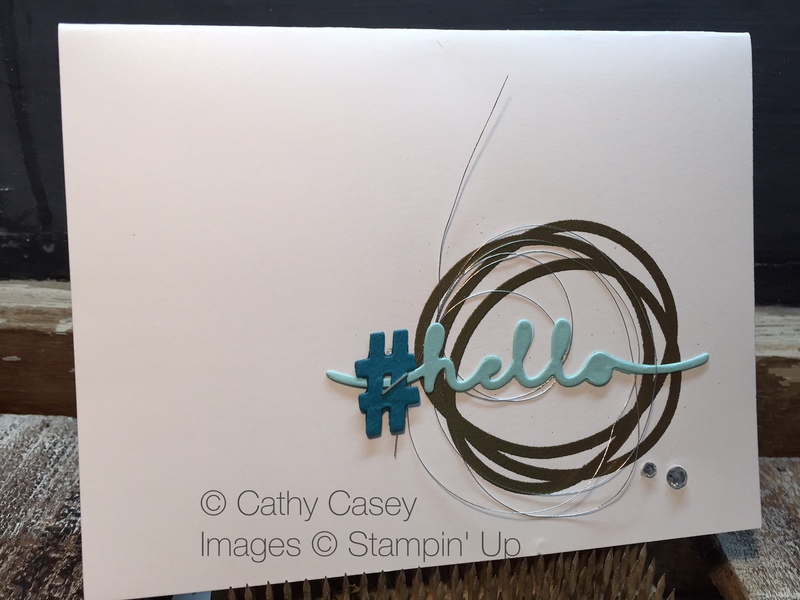 No stamping necessary, I just made a cute little topper to add to the top of a glassine bag. 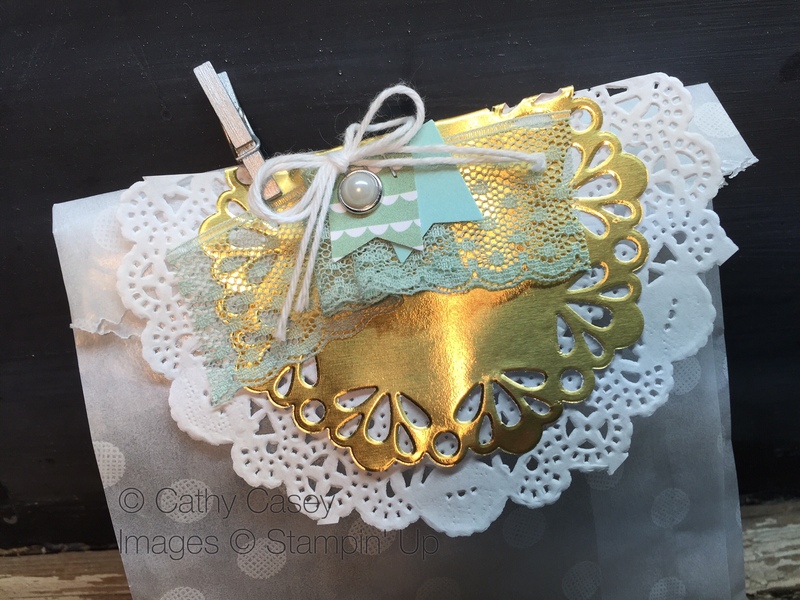 This project features about 3/4 of a Tea Lace Doilie and a small gold Metallic Foil Doilie stacked on top of each other. Two small banners are punched out of Birthday Bouquet Designer Series Paper and Pool Party. A piece of Mint Macaron Dotted Lace Trim is folded accordian style under the mini banners. These are all stapled in a stack to the doilies. A bow is tied with doubled Whisper White Baker’s Twine and added. A Metal Rimmed Pearl is added too. 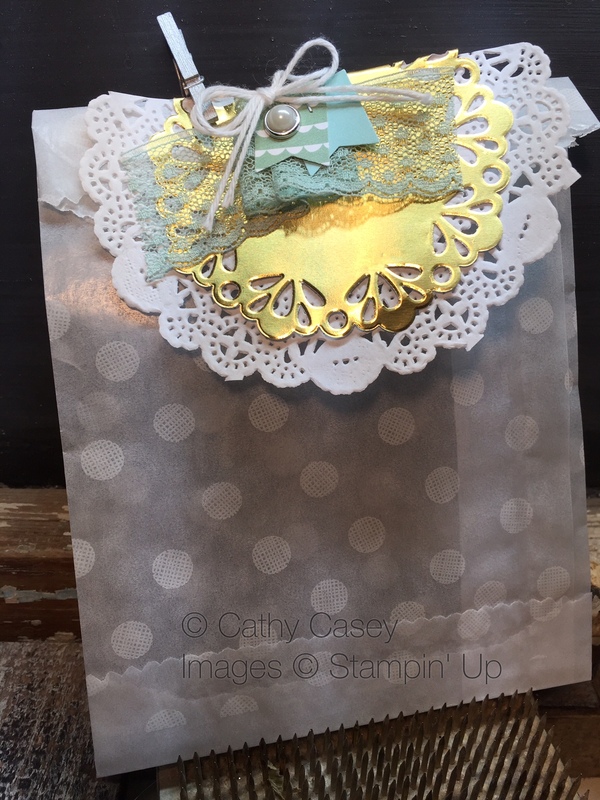 The whole piece is attached to the top of a Sketched Dots Gift Bag. 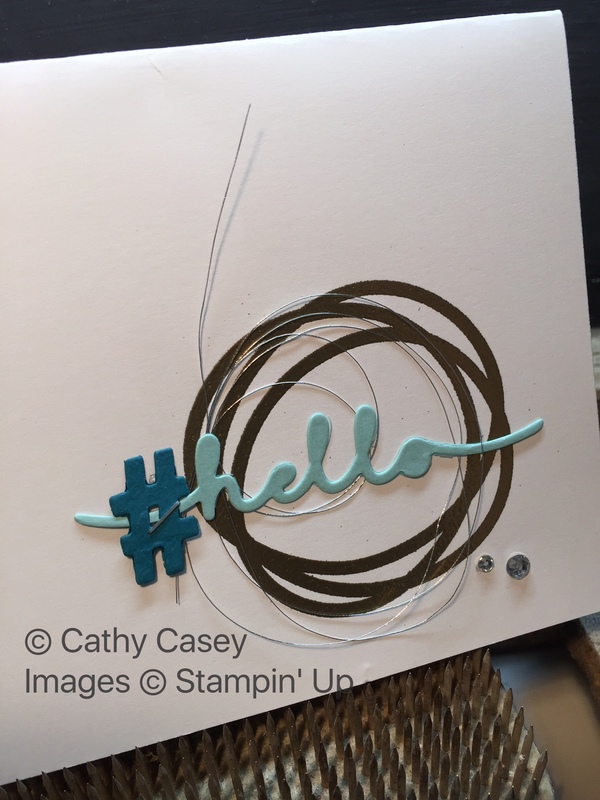 This went together in a few short minutes and looks soooo cute and extra special! I hope you have enjoyed our projects and I am so happy to share a little bit of OnStage with you! 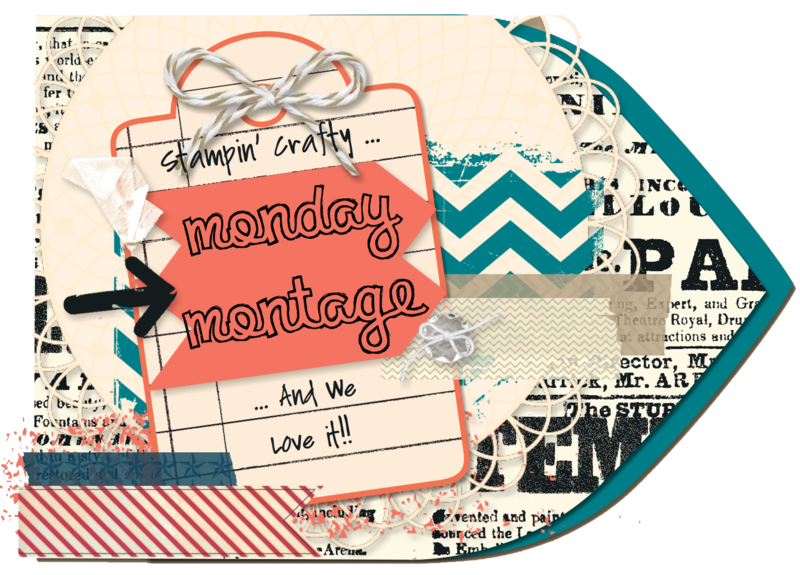 This entry was posted in 2013 Artisan Design Team Finalist, 3-D, Big Shot, Cards, Framelits Dies, Project Life, Punches, Stampin' Up and tagged Birthday Bouquet DSP, featured, Montage Blog Hop, Project Life Memories in the Making Stamp Set, Stampin' Up by kate80132. Bookmark the permalink.